Computer pioneer, mathematician and teacher Grace Murray Hopper recalled seeing her first computer, the UNIVAC “thinking machine”: “When I walked in and saw that monster, I was scared to death!” She had every right to be frightened; the machine consisted of 200 miles of wiring and 5000 tubes, stood eight feet high, was fourteen feet long and seven feet wide. Besides its size, UNIVAC was menacing because computers were still an enigma in 1951. Hopper, often called “the grandmother of the computer age,” played a crucial role in developing modern computer technology and creating COBOL, a computer language that brought technology from the realm of mathematics into the world of business and everyday use. Hopper also took many courses outside her concentrations, in economics, public finance, botany, physiology, geology and electronics. She graduated from Vassar in 1928 with honors in physics and math and went on to study mathematics at Yale on a Vassar fellowship. She married Vincent Foster Hopper in 1930 and graduated from Yale in the same year with a master of arts in mathematics. In 1931, she was offered a salary of $800 a year to teach math at Vassar, and she and her husband moved to Poughkeepsie. The thirteen years she spent as faculty member at Vassar were fruitful. Her innovative and gregarious nature made her classes popular; in one course she invented an entire mythical country to literally “animate” a dry mechanical drawing class. Hopper’s program of self-education also continued. She finished her doctoral thesis for Yale in absentia at Vassar and received a Ph.D. in 1934, taught herself several languages and audited numerous courses at the college: astronomy, geology, philosophy, bacteriology, biology, zoology, plant horticulture and architecture, to name a few. Hopper’s wide knowledge in many disciplines led to her appreciation of each discipline’s unique language and symbols. Later in her career, she became interested in how computers could be used for a whole range of fields, not just in mathematics but in other sciences, for example. In 1941 Hopper and her husband separated (finally divorcing in 1945), and she was busy juggling an assistant professorship at Vassar, a part-time teaching position at Barnard and a faculty study fellowship at New York University’s Courant Institute for Mathematics. She also settled into a new house at the east edge of the campus. But World War II changed Hopper’s life and career path. The creation of the Navy Women’s Reserve piqued her interest and patriotic spirit. Rejected by the WAVES (Women Accepted for Volunteer Emergency Services) in 1942 for not weighing enough, she was finally admitted in December of 1943 and in 1944 was commissioned as a lieutenant junior grade, thus beginning her 42-year career with the Navy and her life-long relationship with computers. Hopper was immediately assigned to Howard Aiken's Bureau of Ordinance Computation Project at Harvard University to work with on the Mark II, which the Navy had commissioned as a successor to the first large-scale automatic digital computer. Lieutenant Hopper returned to Vassar in January 1946 to give the first of her talks at the college about the emerging field at the center of which she was working. Speaking on the Automatic Sequence Controlled Computer and Large Scale Calculator, she, according to ﻿The Miscellany News,﻿ "sketched the history of computing machines.... Any problem can be reduced to successive processes of addition, subtraction, multiplication, division and using tables, and can be computed on the machine which deals with numbers containing up to twenty-three decimal places.... There are six large scale machines in the United States now, each with its trained crew. In the future these machines will be employed more extensively and may be adapted for use in economics and other fields." "This modern calculator," The Misc added in "Lecture Notes," published the following week, "given to Harvard University, but used by the U. S. Navy during the war, has completed 32 problems since it was put to work in the spring of 1944. One of these, amounting to 235 pages of figures, is to be given to the Vassar library. Lieutenant Hopper has estimated that it would have taken over 300 years to compile the results without the calculator." In 1947 the Mark II began to malfunction. "Things were going badly," she later said, "there was something wrong in one of the circuits of the long, glass-enclosed computer. Finally, someone located the trouble spot and, using ordinary tweezers, removed the problem, a two-inch moth.From then on, when anything went wrong with a computer, we said it had bugs in it," thus launching the word "bug" as it applied to computers. Hopper taped the dead insect in her log book. After the war, Hopper remained in the Naval Reserve and joined the Sperry Rand Corp, where she worked on UNIVAC, the first commercial large-scale electronic computer. There she invented the “compiler,” a program which allowed for the computer programmer to “tell” the computer to manufacture its own program. The first version of Hopper’s compiler, the A-0, translated computer code into machine code. Her next compiler, the B-0, or FLOW-MATIC, allowed for the computer to recognize English commands and was put into use in businesses for payroll calculation and automated billing. Eventually Hopper’s work with UNIVAC led her to formulate COBOL, a universal computer programming language. Hopper stayed on at Sperry Rand until 1971, working on new versions of computing systems, programming and educating others about computer language. Hopper briefly retired from the Navy in 1966, only to be called back for active duty in 1967 to standardize COBOL for the Navy. Speaking again at Vassar in 1967, on "Computers and Your Future," she "emphasized the future," she told students, according to The Miscellany News, "because she feels she actually lives in the future. This is only the beginning of the computer age, she said; we are only beginning to know what to do with computers. "She then explained that although computers perform two operations simultaneously (multi-processing), we do not know how to use this power since human beings can only perform sequential rather than parallel thought operations. Creating a form of multi-dimensional mathematics should be our next challenge, she said. She pointed out, however, that one must remember that machines are useless without people telling them what to do and that there is a serious shortage of such brainpower." Eventually attaining the rank of admiral, Hopper served in the Navy until 1986, retiring as the oldest active-duty Naval officer. The recipient of numerous honorary degrees, she was frequently profiled in the popular media, appearing in a segment of the CBS program, "60 Minutes" and instructing the host of "Late Show with David Letterman" on the nature of the nanosecond. in 1969 Hopper was awarded the first ever Computer Science Man-of-the-Year Award from the Data Processing Management Association, and in 1973 she was the first person from the United States and the first woman to become a Distinguished Fellow of the British Computer Society. On December 15, 1983, at the White House, President Ronald Reagan congratulated Grace Hopper on her promotion from Captain to Commodore, which title was shortly thereafter changed to Rear Admiral, Lower Half. Hopper enjoyed recalling that she amused Reagan by observing that she was even older than he. In 1985, in honor of Commodore Hopper, the Navy opened the Hopper Navy Regional Data Automation Center (NARDAC) at Naval Air Station, North Island, CA, and in March 2009, as part of a major reorganization of the Office of Naval Intelligence, one of the four new divisions was the Grace Hopper Information Services Center—the others being the John F. Kennedy Irregular Warfare Center, the Nimitz Operational Intelligence Center and the Farragut Technical Analysis Center. Grace Murray Hopper died in her sleep at her home in Arlington, Virginia, on January 1, 1992, at the age of 85. Grace Murray Hopper is among the many recognized Vassar innovators. Captain Hopper was profiled in 1983 by Morley Safer on the CBS program "60 Minutes." Rear Admiral Hopper discussed her career and explained the nanosecond to David Letterman in 1985. The U.S. Navy's Naval History & Heritage Command's web site contains writings by and about Grace Hopper. Billings, Charlene W. Grace Hopper: Navy Admiral and Computer Pioneer. Hillside: Enslow Publishers, 1989. Williams, Kathleen Broome. 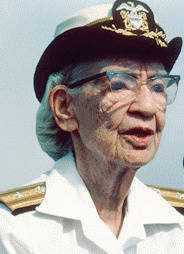 Grace Hopper: Admiral of the Cyber Sea. Annapolis: Naval Institute Press, 2004. “Grace Hopper, Vassar alumna and computer pioneer, dies.” The Poughkeepsie Journal. 4 January 1992. “Thinking Machine Tamer,” THIS WEEK magazine. 4 December 1955.